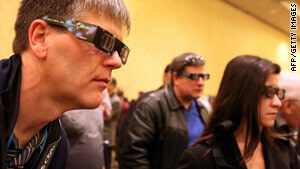 The wild success of "Avatar" has sparked a wave of demand for 3D content in the home. (Mashable) -- We're about to see a new wave of technological innovation kick-start the new year. Right now, more than 100,000 tech giants and gadget geeks are in one place: Las Vegas, Nevada. They are attending CES -- the Consumer Electronics Show -- where countless new gadgets, devices, and technologies will be revealed to the public for the first time. This show is a major trend-setter, not only for the gadgets people will buy in 2010, but for the direction of many businesses and industries worldwide. Technology released at CES has the potential to shift large markets such as entertainment and mobile in new directions, which is why you should be paying attention toemerging trends at this year's show. Three industries in particular could really feel the aftereffects of this year's CES: entertainment, mobile and publishing. The impact of the show on these industries could even reverberate into the entire economy. The entertainment industry has been dealing with a lot of issues spawned by the rise of social media and Web technology. Movie and TV studios are trying to find ways to fight back against piracy and illegal file sharing. They're also debating whether to support new technologies such as Boxee, a service that brings TV to your desktop. In fact, a product known as the Boxee Box will be front and center during the show. The device, no larger than a Coke can, ports Boxee's TV content (including CNN, CBS and Internet TV channel Rev3) onto your TV. The device could have a major impact on how people use their TVs and is a technology many in the entertainment sector are watching. There is another technology that will be prevalent at CES that theaters and movie studios hope will keep people coming back to the big screen: 3-D. The wild success of "Avatar" has sparked a wave of demand for 3-D content in the home. Several vendors at this year's show will reveal 3-D TVs and laptops in order to latch onto this trend. It could change the whole viewing experience. I don't have to tell you mobile is hot right now, but you might be surprised to learn what's going mobile this year. For example, Logitech, LG and Samsung are expected to demo projector phones at this year's CES. Television is also going mobile at this year's show, as Shapiro and others will reveal phones and mobile devices that can broadcast your favorite shows. However, the big mobile trend this year will be Android. It started with Google's announcement of its self-branded smartphone, the Nexus One, but Shapiro, Dell and others are likely to reveal smartphones and tablets that run on the OS. People expect their mobile phones to do more. Not only that, they expect more of what they do to be mobile. That trend will be prevalent in Las Vegas this week. Why should magazine, newspaper and book publishers care about CES 2010? Two reasons: e-books and tablets. In the impending wake of the rumored Apple Tablet launch, many companies are set to reveal their own tablet computers and e-book readers, including Microsoft and Dell. CES could determine if these devices succeed as a whole. If they do, they could continue what the Amazon Kindle has started: creating an alternative way to read magazines and books. This year's show could determine whether publishers need to make their content tablet friendly.